I use the same password with variations, so I never forget. I store all my passwords in a secure file on my hard drive. My browser stores the passwords for me. As I said, these arguments do surprise me, but only for a moment, because I started using a password manager only over a year ago—after being repeatedly encouraged to do so by several friends and colleagues who care about my well-being. Now, that I can fully and honestly admit to myself that life without a password manager is not worth living, I’d like to share a few reasons why you should consider subscribing to a password-management service, even if you feel you don´t need one. More specifically, I will be talking about the password manager I use: LastPass. I chose LastPass because of its high ratings, and because it has a free edition, and once I tried it, I did not have a need to try anything else. 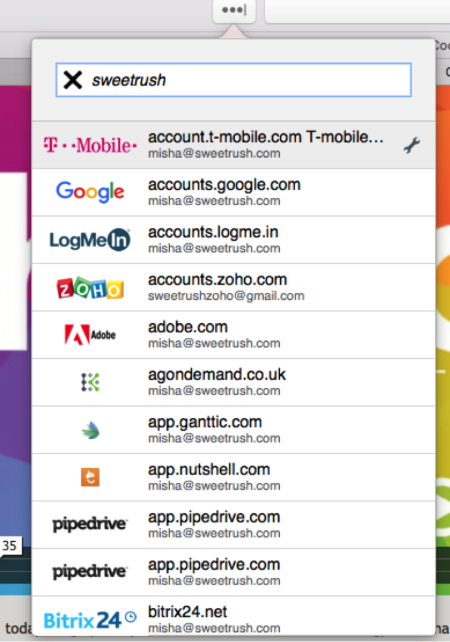 That does not mean that competitors like Dashlane or 1Password are not worthy. In fact, I do recommend that you at least check out the alternatives before committing to one product. As for me, LastPass is what I use and what I know. 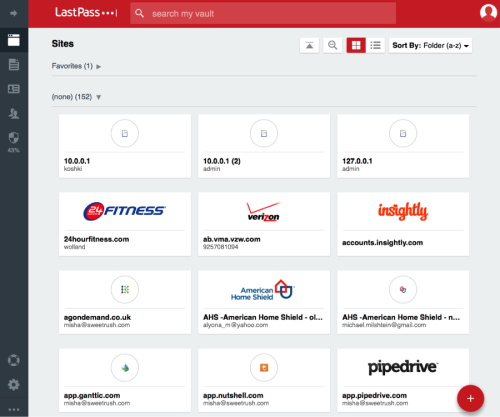 As you install LastPass for the first time, it will ask for your permission to collect existing password information from all browsers installed on your system, and you may be surprised how many nuggets of your login information are there! That alone immediately made me a fan of LastPass: I did not have to re-enter the data. My passwords were already in my system, whether I realized it or not. 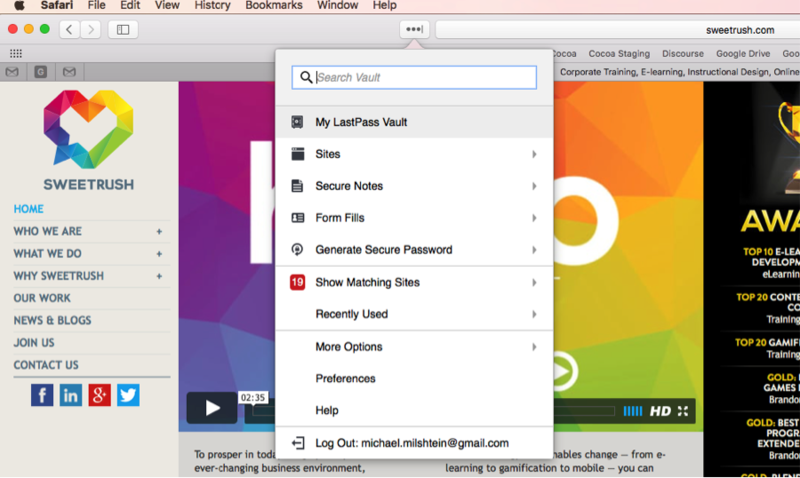 LastPass works as an extension that installs on each of the browsers on your computer, and if you are anything like me, jumping between Safari®, Firefox®, and Chrome™, you’ll appreciate the convenience of seamless cross-browser experience. Your information is stored on the cloud, and therefore shared between computers. If you’re using the premium paid service (which I do not), it’s also going to work on your mobile gadgets. Even if you opt for the free service, you can always access your LastPass Vault from any device, and look up your information. “Password manager” is a commonly used term, but in reality, these utilities are personal data managers. You can use them to fill all the usual web forms—addresses, phone numbers, credit card data, etc. Now, this is a big one! If you’re logging in manually, LastPass will detect your actions and ask if you want to store the information. If you are on a site previously stored in LastPass but using an unknown login, LastPass will ask you whether you want to update the information, or store it as the new login. This seems trivial, but is in fact very important. For instance, I have a number of personal and professional accounts on various Google™ services, and having an assistant that does not get confused and stores everything properly is a true time saver. This also makes maintenance much easier! Remember that secure file of yours? You need to maintain it manually every time you change your login information. LastPass does it automatically. This is as useful as it is simple. LastPass also works as a bookmarking utility, and when you are using it as such, it will log you in automatically for the sites that allow this. This feature generates secure passwords for you. It is indeed helpful when your creativity lets you down, but the fact that it will immediately store it in the Vault is priceless. This is the idea, really: you do not need to remember the information, and in most cases you do not even need to look it up. Auto login will do the work for you (see above). Two-factor authentication has become increasingly popular, and really a “must” for all utilities that store sensitive information. If you choose to use this option, the login information alone won’t be enough to open your LastPass Vault. The system will use a second factor to authenticate you; it might be a code sent to your phone, or a digital token generated by an app. Either way, you have additional protection in case you lose access to your laptop. Yes, there is, and I invite you to check the extensive list of the tool’s features for yourself. 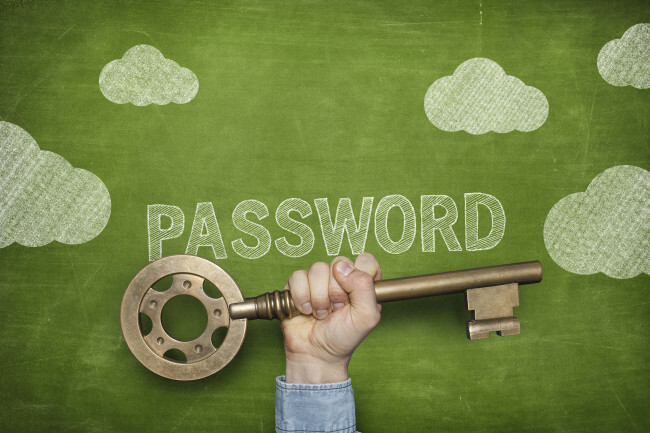 Also, articles like “The Best Password Managers for 2016” will give you a quick blow-by-blow, for LastPass and for many other utilities from the same category that currently exist on the market. Finally, to make it easier for you to try more than one product, you can always resort to features like (i.e., install one manager, try it; install a competitor, import the data from the previous utility), which will let you spend minimal time on data entry and more time playing with the tools. When it comes to Flash vs. HTML5 in e-learning industry, how can you tell that..
Let Your Hair Down in Your New Convertible! So, the technological tides are turning again, and something that is not so new is.. In the famous infographic “What You Wish You’d Known Before Your Job Interview,” the authors skillfully..
On May 1, 2013 Adobe released a small statement on their community forum, acknowledging a.. This research is brought to you by SweetRush’s senior software engineer, Andrew Kubay, who was..